Can scary labels, scary taxes end smoking? New York is the extreme -- it has the highest cigarette prices in the nation, because of steep taxes on each pack. I knew that hotel gift shops routinely charge a premium for convenience, so the $18.30 price had to be on the lofty side; I walked down the street to check cigarette prices at a Duane Reade drugstore, and was told that even there they ranged from $10.88 to $13.80. A pack-a-day smoker in New York City pays well over $3,000 a year for cigarettes. The government does not want people to smoke, because smoking, beyond any question, can lead to serious illness and death. One of the ways federal, state and local governments try to dissuade smokers is to hit packages of cigarettes with taxes intended to make potential purchasers think twice because of the elevated prices. The Centers for Disease Control and Prevention is quite blunt about this: "Raising the price of tobacco has proven to be one of the most effective strategies for preventing and controlling tobacco use." The CDC says there is a dollars-and-cents formula; it says that each 10% increase in the price of cigarettes is estimated to reduce consumption by nearly 4% among adults. According to the organization Campaign for Tobacco-Free Kids, nationally the average per-pack state excise tax on cigarettes is $1.46 (this is in addition to a federal tax of $1.01 per pack), and the average pack of cigarettes is sold for $5.58. Yet here is a surprising statistic: According to the CDC, there are approximately 46.6 million adult cigarette smokers in the United States. After all these years of government warnings about how sick cigarettes can make you, and all the tax increases: 46.6 million. The CDC says that the percentage of adults who smoke has gone down dramatically: 42.4% were smokers in 1965, and 20.6% were smokers in 2009, the most recent year tabulated. But the population of the country has grown, so the raw number of smokers today is almost as large as it was in 1965, when, according to the CDC, there were 50.1 million adult smokers. It makes you wonder whether those startling, explicit illustrated warning labels that will be printed on packs of cigarettes starting next year are, despite all good intentions, destined to fall short of full success. You've probably read about the labels. They will cover half the surface of each pack of cigarettes sold in the U.S. Health-advocacy groups and government officials say the labels are designed to discourage cigarette consumers at the point of purchase. There are nine illustrations that will be used. They include a photograph of a diseased lung, a picture of a tracheotomy hole in a man's throat, a picture of a man with his bare chest surgically stitched up. . .they are genuinely revolting, and no one will be able to buy a pack of cigarettes without seeing the pictures. The R.J. Reynolds Co., manufacturer of Camel, Kool, Winston and Salem cigarettes, has said that the government-mandated images it will have to feature on its packages are "intended to elicit loathing, disgust and repulsion." But if 45 years of increasingly alarming warning labels hasn't wiped out cigarette smoking, there seems to be a question about whether anything, including higher taxes, will. 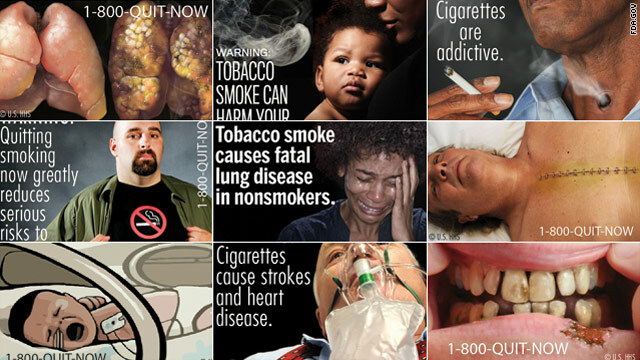 How many of today's 46.6 million smokers do you suppose will see the new warning illustrations and think: "I didn't know that -- cigarettes can harm your health? Cigarettes can kill you? I had no idea." Is there anyone in the United States, smoker or nonsmoker, who isn't aware of that? If cigarettes were a brand-new product, being introduced for the first time right now, there is no way they would be allowed on the market. But they have been around for so long that, gruesome warning labels aside, there is no chance that they will be outlawed. Cigarettes, in the years before the first warning labels went on in 1966, were an impulse purchase: 35 cents, 40 cents, 50 cents a pack. But of course, cigarettes also used to be presented as a happy and carefree part of Americana; during the 1940s and 1950s, when the holiday season came around each year the cigarette companies would sell specially designed cartons, covered with pictures of wreaths and berries and of Santa Claus. Children gave them as gifts to their schoolteachers, families handed them to their milkmen and postal carriers. In retrospect, the message might as well have been: "Merry Christmas -- hope you die!" But few people thought of cigarettes as being potentially fatal in those years. You would think, with the rising price of cigarettes, some people might just decide to listen for fire-engine sirens, follow them to the site of the blaze, then run into the burning building behind the firefighters and inhale a lungful of smoke. It would be more economical. There are 20 cigarettes in a pack; the people buying the higher priced ones in that hotel gift shop are, in essence, rolling up a dollar bill and setting it on fire each time they smoke.